Review sites are here to stay and chances are your customers are already using them. With the rise in online customer review websites, a company’s every action, good or bad, is scrutinized and written down for public consumption. Approximately 26,380 reviews are posted on Yelp every minute, and as of June 2017, the site had accumulated 135 million reviews. Yelp contains information on businesses in at least 32 countries spanning North America, South America, Europe, and Asia. 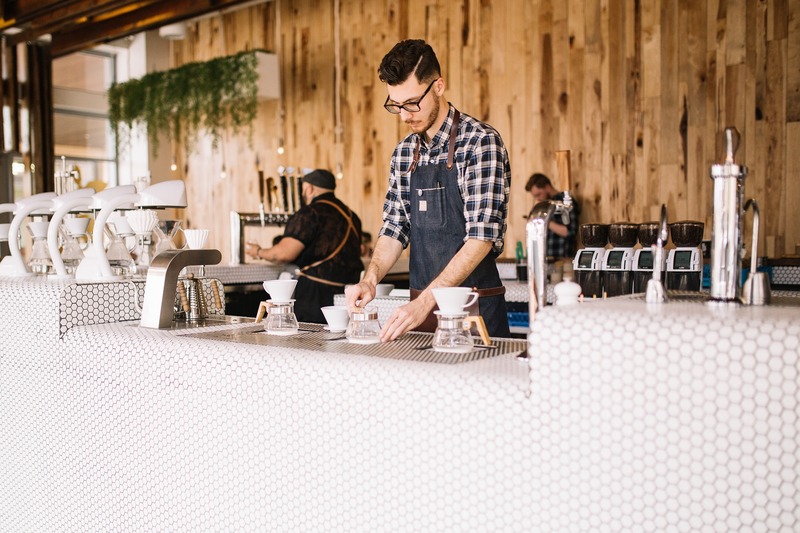 Yelp has proven itself to be a industry leader for customers to not only review businesses but also to find quality businesses, whether in their home city or on the go. Unfortunately, many business owners do not take advantage of the services that Yelp has to offer including claiming their Free Business Page and investing in Yelp ads. A business’s current and potential consumers are already visiting Yelp; therefore, it is only logical to advertise where customers are already looking. The best part about claiming your Yelp Business Page is that all these services are included completely free of charge. 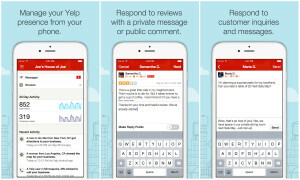 Yelp has even created a free mobile app called Yelp for Business Owners that allows businesses to control their Yelp profiles on the go. Yelp is transparent about which business pages are unclaimed. The image below shows a mexican restaurant in Durham, NC that has not been claimed. If a business owner has not claimed their business page, the word “unclaimed” will appear below the company’s name. To claim your business simply click on the word “Unclaimed” and it will route you to a page that provides step by step instructions. Yelp will then verify that business page was claimed by the actual owner or someone associated with the company. While businesses report seeing an $8,000 increase in annual revenue from claiming their Free Business Pages, companies that invest in Yelp advertising report seeing a $23,000 increase in annual revenue. This means that companies investing in Yelp advertising see revenue increases that are almost 3 times more than their competitors who are not taking advantage of Yelp Ads. The numbers speak for themselves; investing in Yelp advertising is a no brainer. 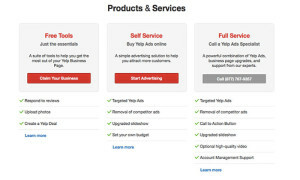 Advertising is not part of Yelp’s free tool kit and must be purchase for an additional charge. However, Yelp has many options for businesses to choose from, allowing them to control the cost and other key components of their ad campaigns. What do Yelp Ads Look Like? Yelp ads provide potential customers with important informations about your business. Every ad contains the business’s name, photo, rating, location, phone number, and a relevant review or company specialties. If a company has not accumulated enough reviews, they will need to provide a written description of what services their company provides. To learn how to increase your Yelp reviews check out the article 7 Simple Tips On How To Increase Yelp Reviews. It is important to note that these paid advertisements are labeled as “ads,” and this notation appears in the top left corner of the advertisement. Before any of your ads are released on Yelp, you are given the chance to review what the ad looks like and make edits. Now Where do Yelp Ads Appear? 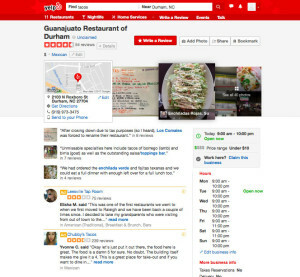 Yelp Ads will appear in several different places on Yelp including in search results and on competitors’ Yelp pages. 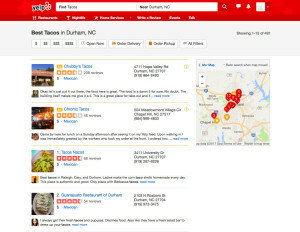 For example: I searched for Taco restaurants in Durham, North Carolina which can be seen in the picture below. As you can see from the search results the top two options for restaurants are advertisements and then the organic search results start as the third result. Yelp ads will draw attention to your business and ensure that it is featured in front of an audience who is already interested in your products or services. This ensures that your ad will only be viewed by potential customers. Similarly, ads will appear on competitors business pages. Like ads that appear in the search results, your ads will only appear on competitor pages that cater to a similar audience. However, to ensure that a competitor’s ad does not appear on your business’s page you can add a feature to your ad package that blocks competitors’ ads from appearing on your page. The image below shows two ads appearing on a competitor’s page. Another important feature is that businesses only pay for an advertisement when it is clicked on; therefore, even if the ad appears as the top search result, you will only pay if it is clicked on. In addition, Yelp ensures that your ad campaign will adhere to a budget that makes sense for your business and will never go over the agreed upon amount, which will put any budget conscious business owner’s mind at ease. Once your budget is met your ads will stop appearing. If you notice that your budget is running out quickly every month, there is always the option to adjust your budget. 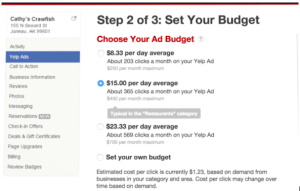 When setting up an ad campaign, Yelp will give you a recommended budget and approximates how many clicks per month that budget will allow. However, there is also the option to create a custom budget, giving you complete control over your spending. When setting your own unique budget you will manually enter the monetary amount you are willing to spend. Even though Yelp has set out safeguards to protect you from blowing your budget, many business owners may ask themselves whether or not people will trust their ads or simply ignore them. It is no secret that we live in a society saturated by advertisements and marketing schemes, creating a generation of savvy shoppers. Therefore, it begs the question about whether advertising is still worth investing in. A recent study conducted by Northwestern University marketing professor, Kent Grayson, came to the staggering conclusion that many people describe “modern advertising techniques” as “credible,” “fair,” and “good.” While people describe marketing techniques such as using celebrities endorsements or paid actors as deceptive, they respond positively to review sites such as Yelp. A New York Times report concluded that, “Certain tactics, such as offering to match a competitor’s low prices, reporting a high rating on a site like Amazon or Yelp or mentioning a recent ranking by a third-party source like U.S. News & World Report, received the most positive reactions from participants.” It is undeniable that Yelp has gained the attention and trust of the general public and is recognized as a reliable source for business recommendations. Therefore, businesses should take advantage of all that Yelp has to offer. Yelp receives an average of 108.4 million unique views from around the world each month, with the vast majority coming from the United States. Yelp has proven itself to be a reliable platform that reaches a global audience accessible from your desktop, smartphone, and tablet. With Yelp advertising you can now reach your target audience anytime and anyplace.